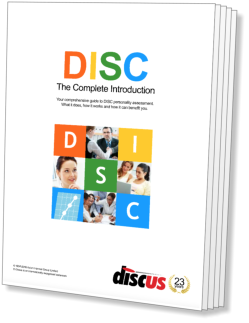 The four factors of a DISC analysis provide a useful way of summarising a profile. For a full interpretation of a profile shape, DISC provides a useful technique for quickly extracting even more sophisticated information from a graph. This technique is known as 'sub-trait analysis'. 'Sub-traits' describe the relationships between different pairs of factors within a single profile graph. Because there are twelve possible pairs of DISC factors (D and I, D and S, D and C, and so on), there are twelve corresponding sub-traits. Each of these pairs of factors is given a meaningful name to help relate it to some particular style of behaviour. As an example, take the sub-trait 'Efficiency', which describes the relationship between Dominance and Influence. Sub-traits are typically described in shorthand with a slash ('/') sign, so 'D/I' (pronounced 'D over I') describes the sub-trait of Efficiency. In this guide, we have represented this relationship graphically, as shown in the example on the left. To measure the amount of a sub-trait in a particular profile, look at the relationship between the two factors it describes. 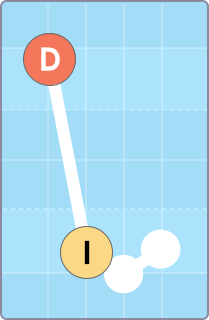 In the example shown on the left, Dominance is very high, while Influence is low. This means that this profile contains high levels of Efficiency (we say 'D is over I'). If the opposite were the case (high Influence and low Dominance, or 'I over D') Efficiency would be very low in the profile. In this case, the profile would describe a 'Friendly' individual (see descriptions below). As we said, there are twelve possible combinations of factors in a DISC graph, each with its own attendant sub-trait. Click the name of any of the sub-traits in the list below for a description of the type of behaviour to which it relates. Remember that any given profile can contain more than one sub-trait - as well as Efficiency, for example, the illustrated profile above also contains 'Self-motivation' (D/S) and 'Independence' (D/C). True sub-traits derive from inverted relationships between factors (a sub-trait is at its strongest where one of its factors is high, and the other low), but we can also consider mutual pairs of factors. Factor combinations like this give us four further traits from a profile; traits that are at their highest when both their component factors are high, and at their lowest where both components are low. For example, consider the factor pair of Influence and Steadiness. Both of these have social aspects to their style; High-I's are self-confident and outgoing, while High-I's tend to take a more accepting and patient approach to others. There are social aspects to both these factors, so when they are both strongly present in a profile, we can say that that profile is high in Sociability. Given that there are four DISC factors, you might expect to see six pairs of factors in this list. In practice, the combinations D+S and I+C are omitted. These are theoretical opposites, and while their combinations do have characteristic behaviours associated with them, those patterns of behaviour tend to be rather too complex to be easily condensed into a single word or phrase. Combination traits like this tend to be most useful when they are distinctly high, or distinctly low in profile. Where one or more of these factor combinations is strongly represented in a profile, it can give useful summary information about the individual concerned, but with somewhat less precision than the profile's twelve true sub-traits.